A bit of a sci-fi diversion today. Two of the figures that have been taking up space on my desk and in a figure case for years are this pair. 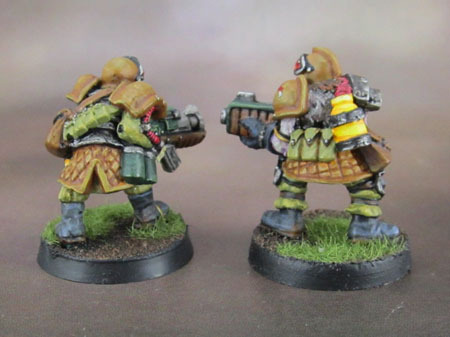 Lt. Varras from the Warhammer 40k 4th Edition “Battle for Macraggae” starter set. He’s also often simply known as “Imperial Pilot”. In any case, he’s been kicking around here for 11 years – and had his boots black and greatcoat grey for much of that time. Lt. Varras, Imperial Pilot. Dr. Diana, Cybertronic Medic. Dr. Diana is a cloned doctor from the Cybertronic MegaCorp faction in WarZone (1st Edition, though she’s apparently still a thing now in WarZone resurrection.) She used to have a black top and bare legs as part of my nWo sub-faction for Cybertronic, back when we used to play regularly in the mid-1990’s, but after the campaign expired, she just sat in a case and never got finished. Several years ago, I decided to pair her with Varras as a fellow Imperial Navy Officer and paint her outfit in a matching grey, and again – like Varras, she’s been sitting around part painted for the years since. It’s a pretty safe bet that she’s a Werner Klocke sculpt, since she shares the same female face that almost all of his models have. 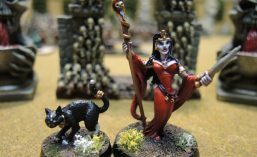 Yes, she’s been part-painted for going on 20 years. God I feel old. I was going to paint a red or green cross on Diana’a Med-kit, but I decided against it in order to keep her a little more generic. Now, a pair of Imperial Flight Crew. So anyway, the story ends a week or two ago when I was looking for stuff to make myself finish as part of the desk-clearing project I’ve been on for the past several months and spied these two. 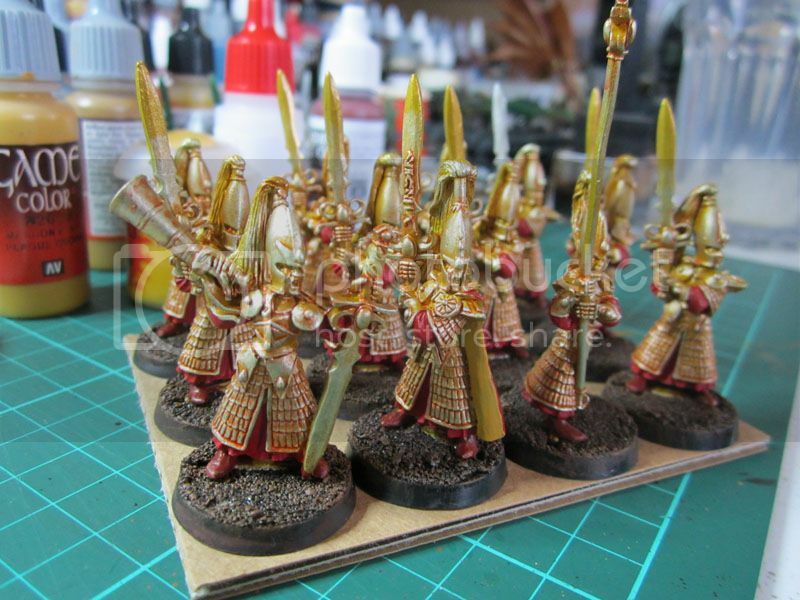 Always easy to overlook, I finally forced myself to knuckle down and got them done. 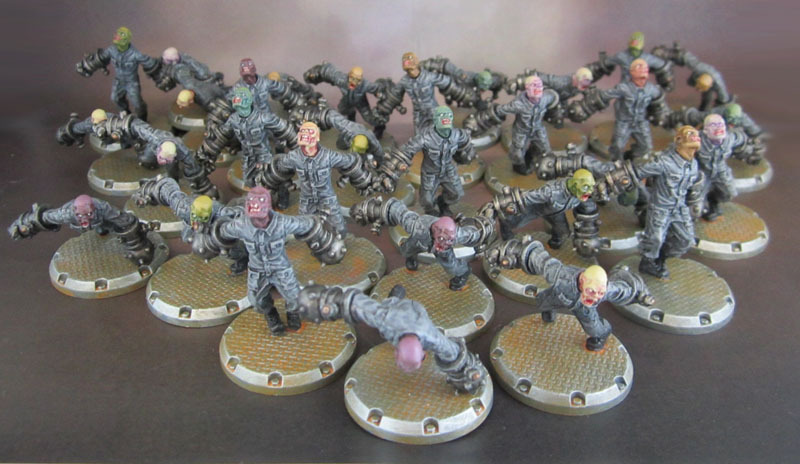 Aside from using them as potential 40k objective markers and such, they’ll also easily fit into my RPG games of Rogue Trader (once I get it off the ground) and both are generic enough to work for many other Sci-Fi/skirmish games from Inq28 to Judge Dredd. And now I’m actually quite happy with the pair of them. They make a nice pair of Imperial Flight crew! 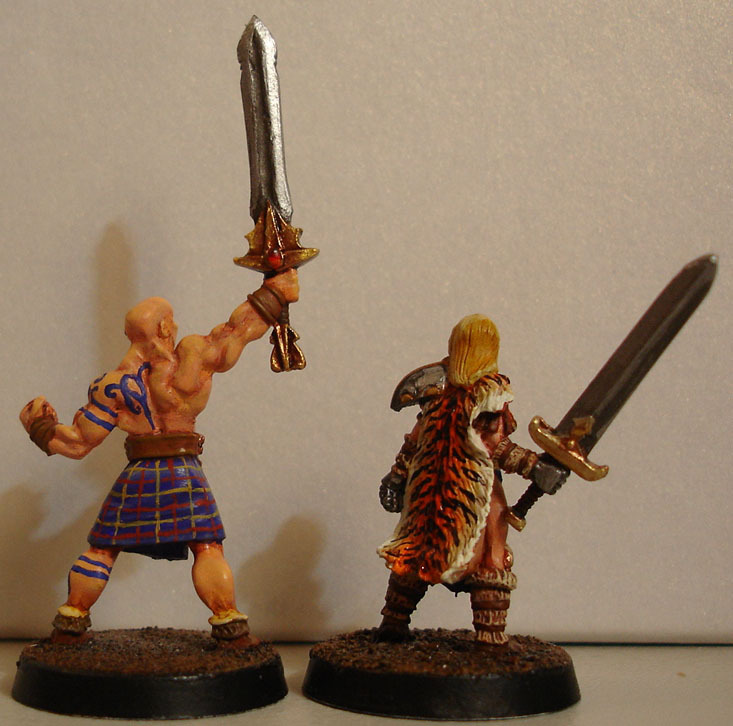 Some more painted figures from the LatD Army-oriented models. WarZone 1e Dark Legion Heretic and Iron Maiden T-shirt. 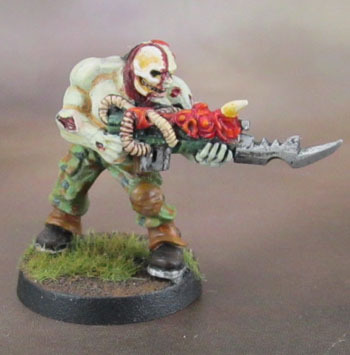 I’m still pretty proud of this figure, another from the WarZone 1st Edition line – he’s a “Dark Legion Heretic“. 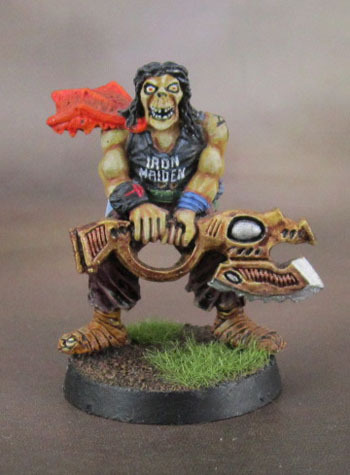 I’m not especially a fan of Iron Maiden, but with that face, could he actually be Eddie in miniature form? I clearly thought so! Replicating their well-known font on a tiny miniature t-shirt was always going to be a bit much, so I went for more of a “Heavy Metal”-friendly font. 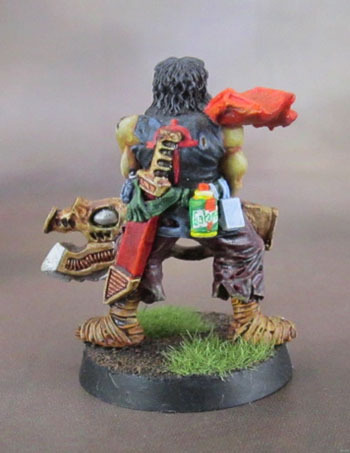 Dark Legion heretic with Gatorade Bottle. Stay Hydrated! He’s painted with Dark Legion iconography rather than Nurgle or Chaos, but the DL is pretty much Chaos with a different name. The interesting/fun part of this model is the Gatorade bottle I gave him. 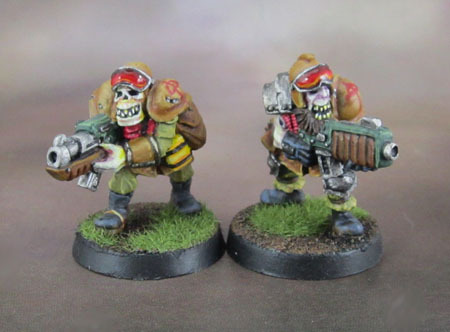 These two are (I think) Necromutants. 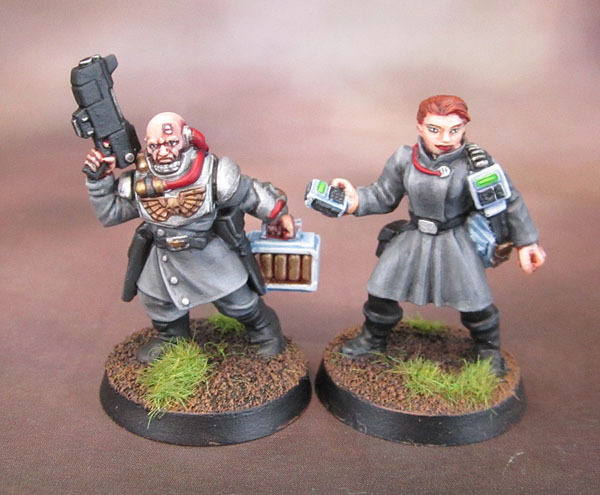 I can’t find them on the Prince August site, and I suspect that these two might even predate WarZone 1e and actually be Mutant Chronicles models. Clearly these two were sculpted by Kev Adams as their faces both have his trademark style. From their faces, they look almost like they used to be an Ork and Squat, now fighting side by side in undeath. Which suits Nurgle just fine. This guy is an Undead Legionnaire. 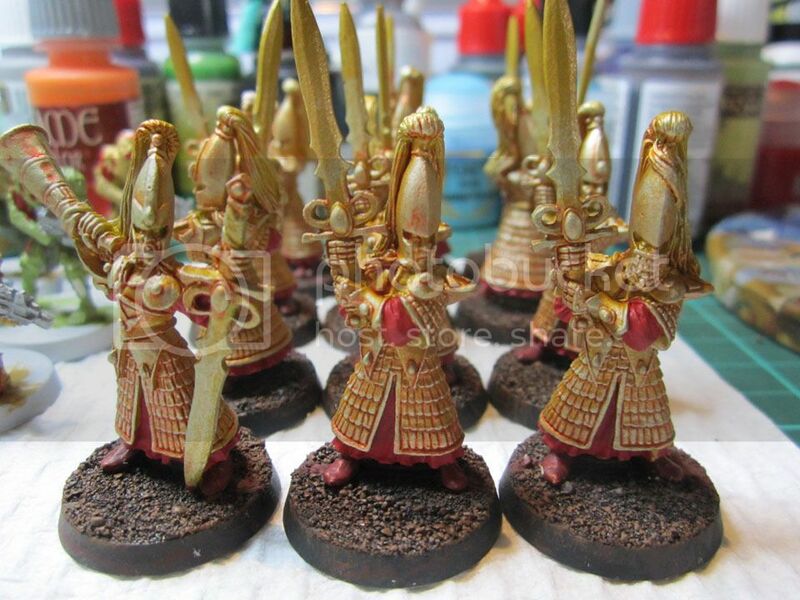 They usually come in sets of four models, but apparently I only have the one painted. 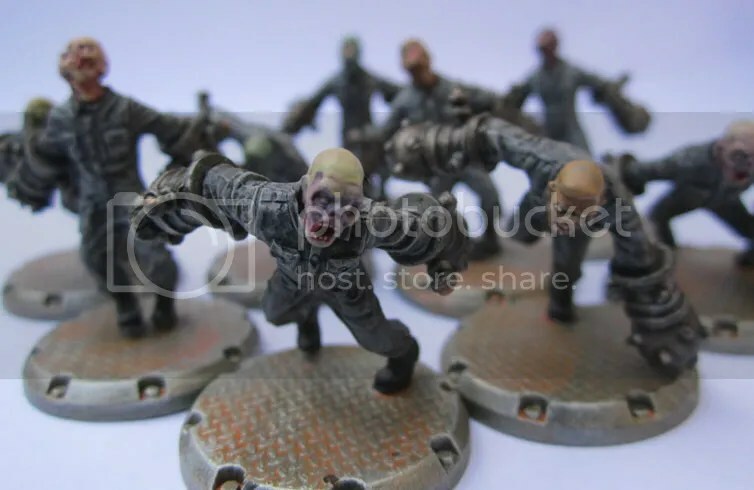 While the Blessed Legionnaires are much more generic zombies, the models of the Undead ones are designed with the look and uniforms of the WarZone corporations. This guy is a former Cybertronic trooper. I believe I have some more of these – but – down the track! Sharing is caring – want some sausages? These two pics aren’t that great. I may have accidentally turned off the Macro function, according to Marouda – and the Zombie is pretty washed out. 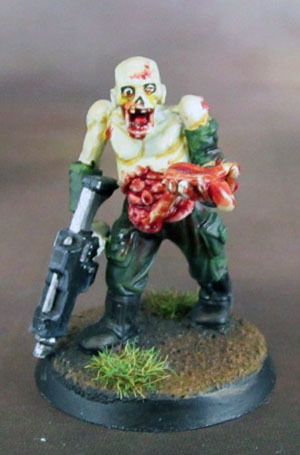 I built this guy using Citadel Catachan models combined with their Plastic Zombies and a bit of putty. I built it for use with the first edition of Frag! as I recall. 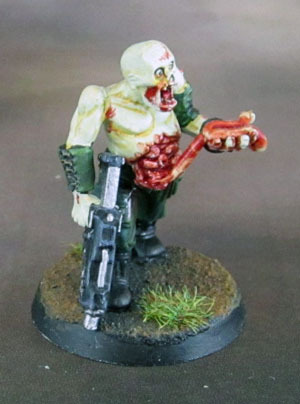 He’s also got a welcome place with Papa Nurgle’s band of misfit models. 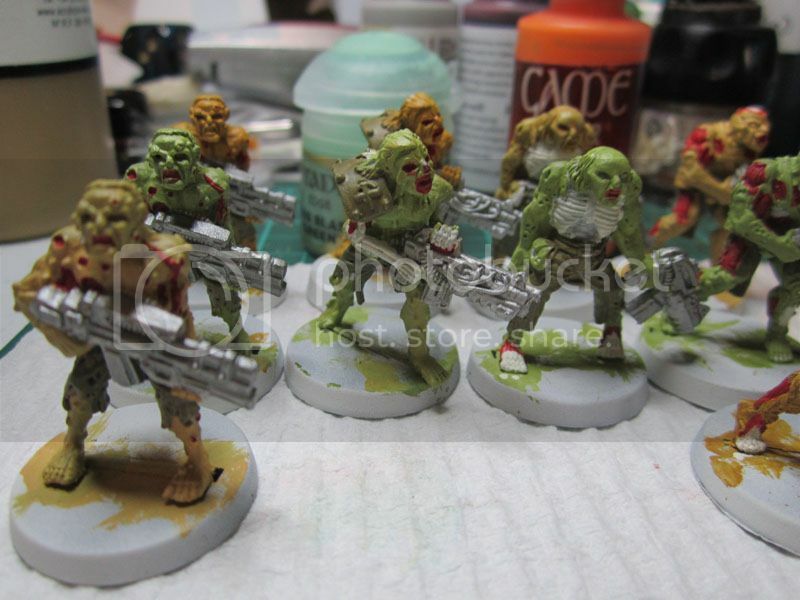 Plague Zombies and Plague Mutants. 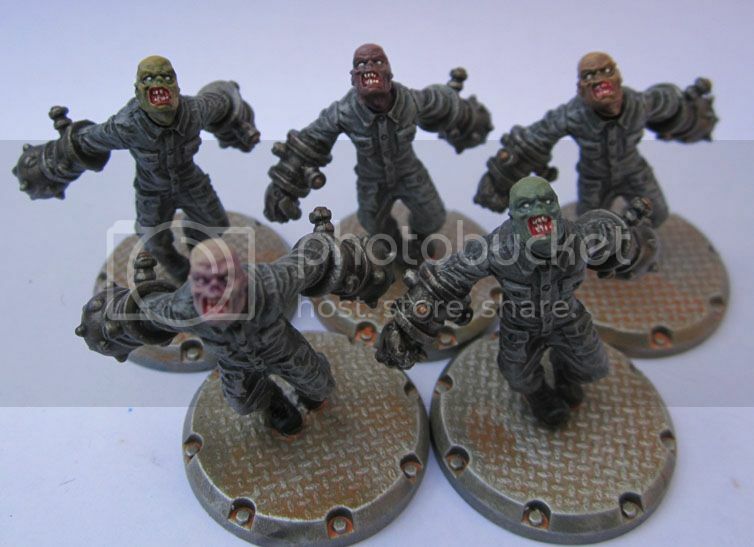 DUST Zombies, ready to be Poxwalkers. 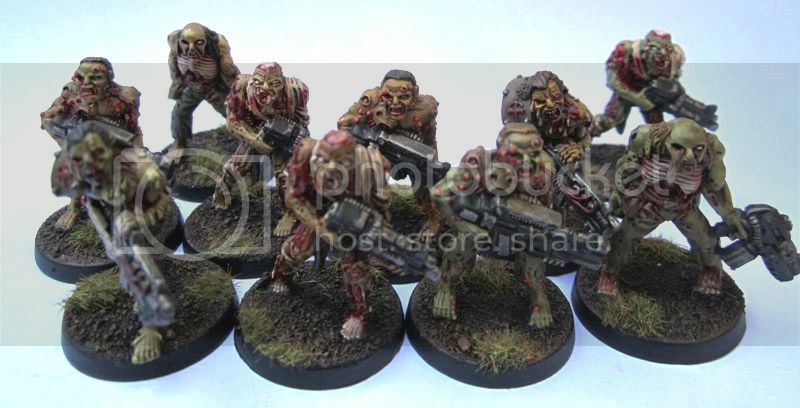 Much like the DL Blessed Legionnaires in the last post, I’ve shown these DUST Zombies before but took the opportunity to take a new photo of them, as Nurgle Plague Zombies were always one of the things I had in mind when I painted them originally early last year. Men In Black – Warzone “Corporation” Miniatures. 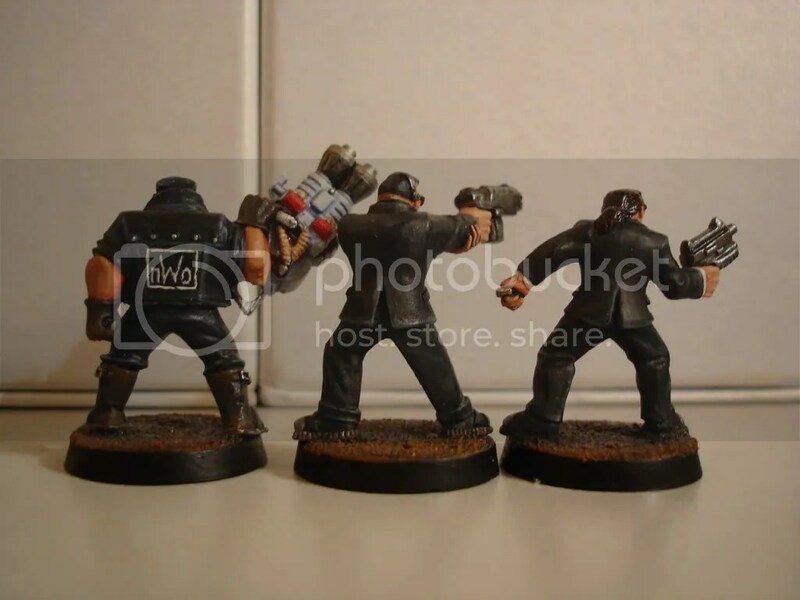 My guys at the time were a Cybertronic force, but instead of painting them grey, I painted them based off of the WCW “nWo” (New World Order) wrestling faction. They were Tres’ cool back then with their black outfits and stylish T-shirt logo. I naturally painted my few Corp guys to match. And the same. From the back. 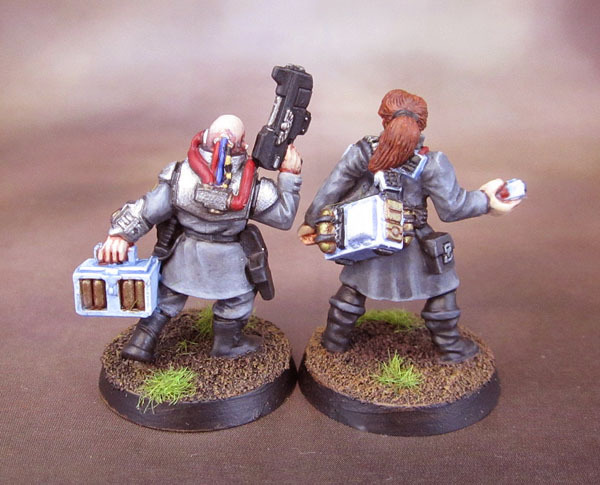 The photos aren’t especially brilliant (the shading on their clothing is both more noticable and more subtle in hand) and they haven’t yet been varnished, (hence the shiny ponytail). 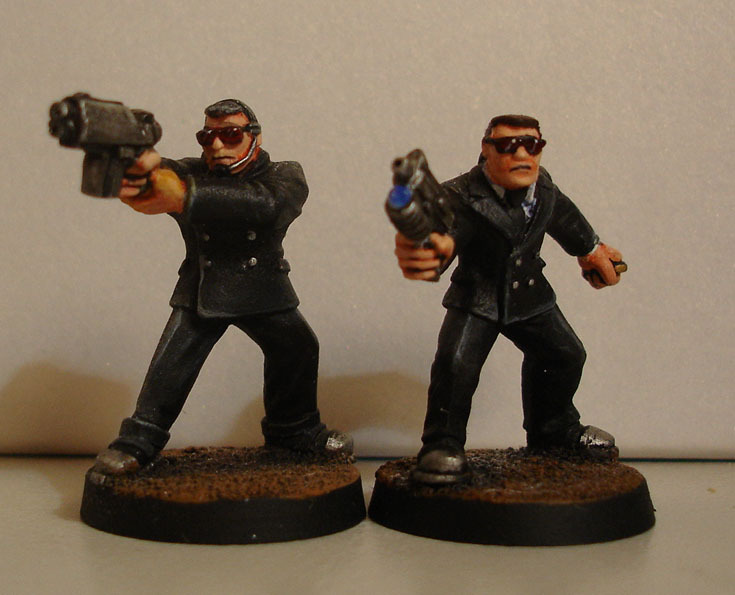 I’m in two minds as to whether or not I should add the typical “GW style” highlight/shade/light point to the sunglasses, or simply go over them with gloss once the figures are sealed. Actually, I’ll need to do that to the torch on Ponyboy’s pistol. I’m overall happy with the simple act of getting them finished, though my fav of the three is the Maori-tattooed bouncer. I swapped the front of his Ghenna Puker (aka Warzone’s crap-looking flamethrower) with the main section of a GW Heavy flame, probably off a Chimera or Russ kit. Makes the weapon a bit bigger and a lot nastier looking. 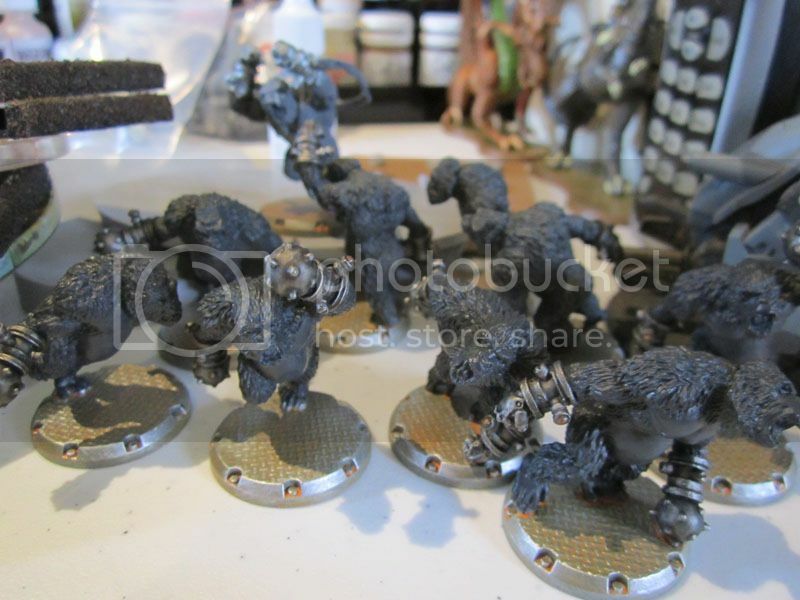 Bases are kept plain and pretty generic so they fit in with as many different settings as possible. I generally don’t go for overly-specific bases, though I have warmed to them in some cases these days. Haven’t had much of a chance to take new photos or paint anything this week, so this update is a bit of a blast from the past. 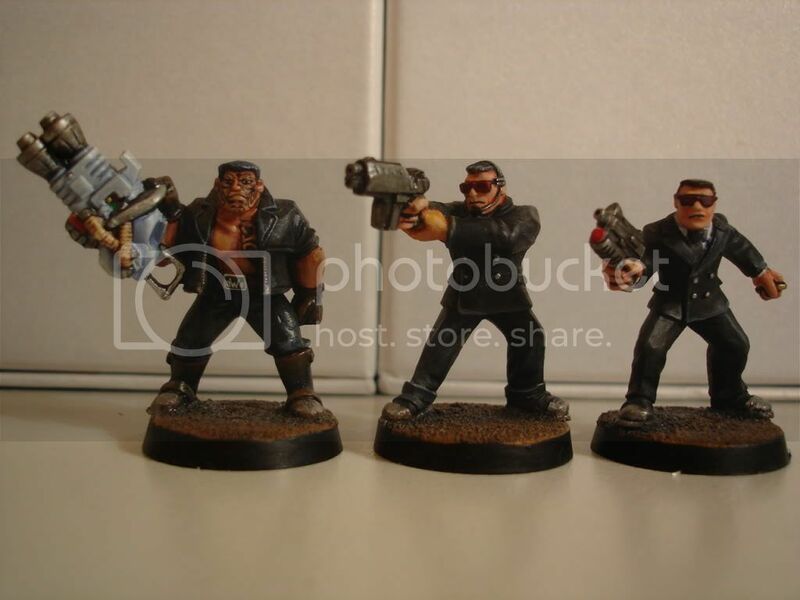 The first pic is some kind of Warzone/Mutant Chrionicles figure. 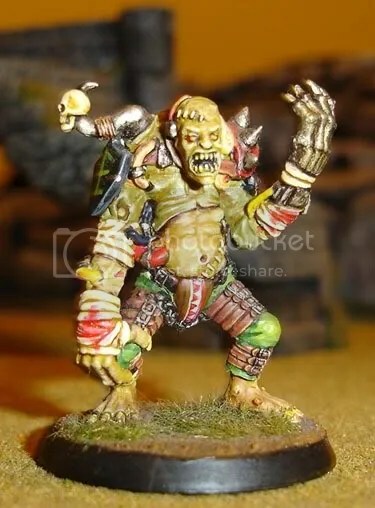 I can’t remember what this guy is exactly, but he’ll fit into a Nurgle-themed chaos cult/Lost and the Damned force well enough, so that will do him, if I ever get around to building and fielding such a force. 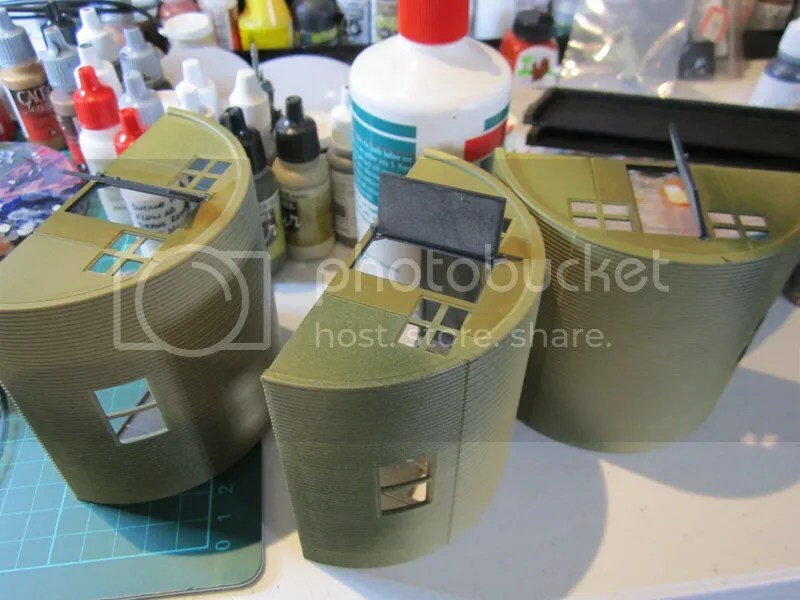 I’m showing him today because I had the photo handy, I think it’s a nice looking paintjob, and I wanted to have some colour in this update by having at least a finished figure included. These are some early assembly/WIP pictures of my Iron Warriors figures, some of whom are finished and shown here (bottom half of the page). 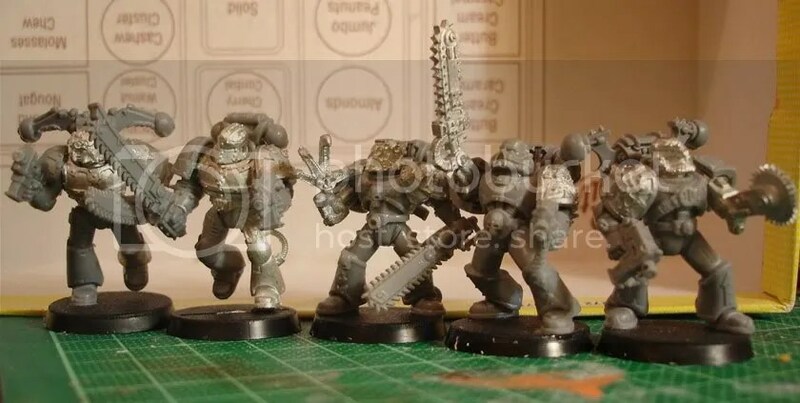 Just a mixture of plastic Marine, Chaos Marine, Khorne Berserker kits with metal components from the Iron Hands and Iron Warriors kits. 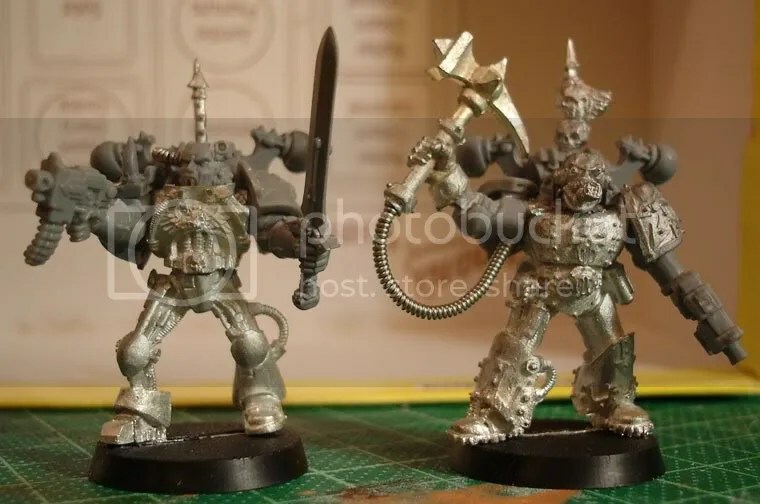 The Warsmith’s (on the right) head is from a Noise Marine, and his Thunder Hammer/Power Weapon is from a Chronopia figure, with some guitar wire added. The champion is just a kitbash of metal and plastic parts, but I think he looks effective. I should pull my fist out and finish these figures someday!